Over the last 12 years, working together with local Federal Judges, led by Judge Breyer, we have created the largest permanent exhibit on San Francisco h istory. Distributed over 4 floors at the top of 450 Golden Gate, the program details the tales of the City from 1850's through the construction of the TransAmerica Pyramid. Vignettes feature the Panama Pacific Exposition of 1915, the creation of the Bay Bridge , Treasure Island, the 1939 Golden Gate Exposition, the Palace Hotel, the Earthquake and Fire of 1906, the Cliff House and Sutro Bathes, Civic Center , Recreation, Districts around town, the Waterfront, transportation and cablecars, the City's great hotels, notable characters, as well as selected content from others areas around the 9th District the Court serves. Each images has a detailed narrative telling the story behind the picture. The program was conceived as a gift to the public from the Court, led by Judge Breyer. The intent was to express the integration of the Courts with the community, providing educational heritage content, foregoing conventional decorative art for the interior walls. Displays are located throughout the public space of the San Francisco building, as well as chambers and Jury Rooms. The project started by considering the Jurist experience in the deliberation rooms, which often were windowless. This exhibit spans four floors: 15th, 17th, 18th and 19th. The 17th and 19th floors have many special exhibit spaces, both curved and over bench seating, that required specific content themes. 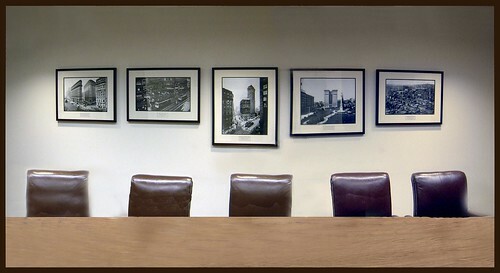 Business Image Group, designed and developed the content, accompanying narrative, refined the often faded original images, and framed and installed the pieces through their production company in San Francisco , Eco-Framing. Each photograph was digitally mastered at the highest possible resolution. was the initial factor in conceiving the historical program.